Guests: Jan Helfeld (4:15), Jadranko Brkic (21:15), Evan Greer (54:53), Jonathan Williams (1:03:08). Jadranko Brkic is managing director of Sloboda i Prosperitet TV (Freedom and Prosperity TV), a libertarian media network in the Western Balkans. He shares his story, from how he fought in the civil war of the former Yugoslavia to being Americanized and living throughout the globe. Evan Greer of the Center for Rights and Fight For The Future is advocating for the release of an 18-year-old facing 20 years in prison for a Facebook post! 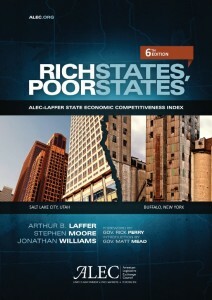 Jonathan Williams of the American Legislative Exchange Council coauthored the Rich States, Poor States booklet, and he discusses his ranking of economic competitiveness. California, in particular, stands out as a what-not-to-do in terms of fiscal policy, and it receives a full chapter of scrutiny. The Manhattan Institute has also prepared a damning report, “The Great California Exodus,” on the state’s. 46. Minnesota 47. California 48. Illinois 49. New York 50. Vermont. Most importantly, according to Williams, over the past ten years the top ten states have received 2.6 million migrants while the bottom ten states have lost 3.7 million. That’s says it all, really.